Preparations are now underway for the new season; we've started clearing up, and preparing the brood fish for the new season. Both males and females tanks are still ambient, but in the next week or two I will start raising the temperature on the females tank, take them through the inevitable parasite treatments and get a bit more food into them before we start the spawning process in early May. I've also been moving on many of my brood fish; the showa's are all gone now except for one male. 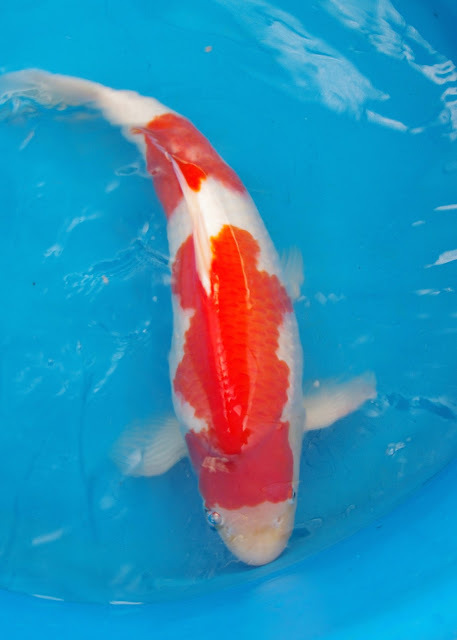 And I've also moved on 3 shiro males; I've retained 2 shiro males and one female just in case I run out of kohaku eggs next year. But the long term plan is to lose these shiro's too and replace with more kohaku options. 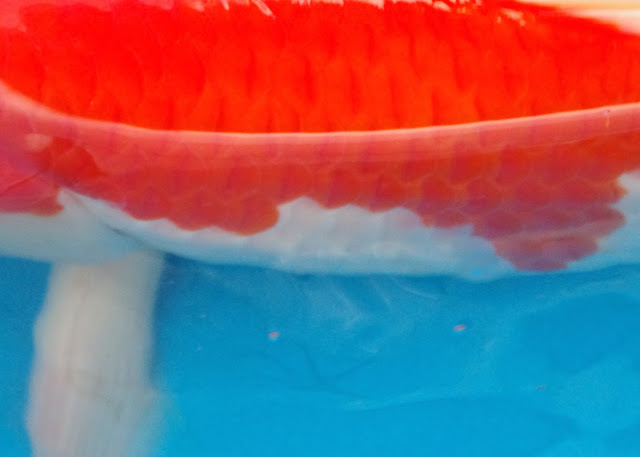 I have one eye on the South of England koi show coming up in June, and am keeping a watchful eye on the nissai that have been growing on this winter - and which ones I may take to the show. I've also started to consider which I may let go too, and as painful as those decisions will be, by the end of 2016 I really need to drop from 15 to at the most, 5. Anyway, we had this one in the bowl over the weekend and thought you might be interested in seeing how it's come along. this came 3rd out of 10 koi in size 2 kohaku at the South of England show in June 2015. 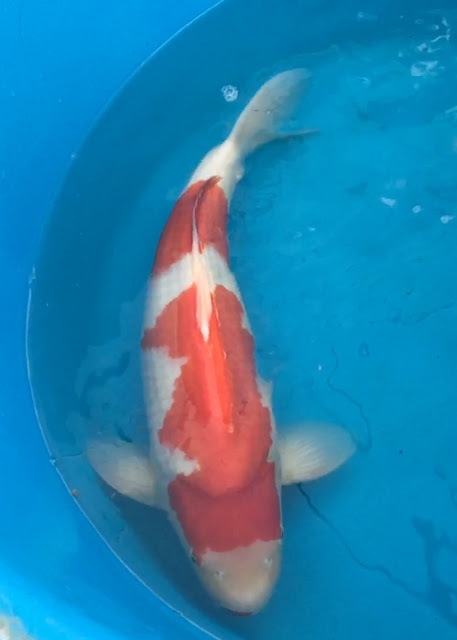 When I took the video in (late) November last year of the nissai entering the growing on tank for the winter - it was 42cm. It's currently 49cm, so 7cm growth in just over 3 months. I'll start with an overhead photo, but the one I really want to draw your attention to is the close up that follows after. 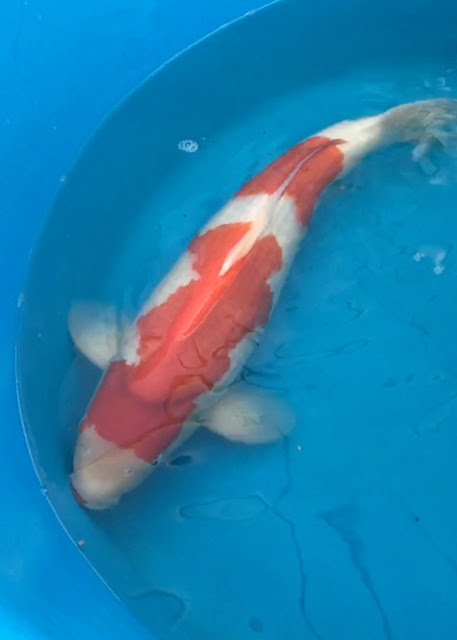 I took some video, and some stills - none of the stills showing the koi overhead like this came out well, so this is a single frame from the video footage. Very happy with the 2 step pattern. This is a close up taken with my DSLR and I'm really happy with the way the red and the skin have developed over the winter. Kiwa looking pretty snappy.